Have you ever thought you should be able to handle anything life throws at you? Have you wondered why you keep going through the motions of life and never seem to get off the hamster wheel? Do you put on a mask most days pretending you’re just fine and tell everyone you meet that your life is hunky-dory? If so, María Tomás-Keegan has something to say about all that: You Are Not Alone! Drawing on her on own experiences, María starts her book, “Upside Down to Right Side Up: Turning Transition into Triumph,” by sharing her view of seven phases of transition. Regardless of the life event, she noticed that the phases she went through to move from tragedy to triumph were very similar. From abuse to divorce. From personal loss to career upheaval. From reinvention to caregiving. María found a way to unpack her treasure chest of tools and techniques, so they could help her move beyond coping and surviving and begin to thrive—making each new life event less daunting than the last. As she relays stories of other women, we begin to believe that we are not alone. As she reveals her life strategies, we understand that there is light at the end of the tunnel. There is hope that we can take control and change our perspective. There truly can be joy in learning to thrive. The book concludes with her five-step system, called “5 Petals of Power,” which helps women take off the mask they wear pretending they are fine. She helps them to find their footing again and clear the path of what stands in their way. The final leg of the journey is clear and concise as she guides women to spread their wings and take flight, so they can make their dream happen. She also published a Companion Journal to provide a place to capture your insights and answers to questions and journaling prompts throughout the book— especially in Part Three. 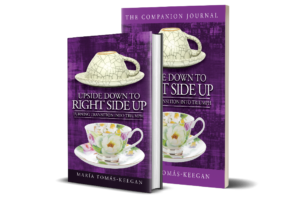 María Tomás-Keegan helps women turn their lives right side up again when a major life event that has rocked their personal world. She knows first-hand how hard it can be to manage work, family obligations and take care of herself while her personal world crumbled around her. She also knows how many things can change when life events like divorce, loss, care-giving, layoff or retirement happen (to name a few). Through her 30+ year career in marketing, investor relations and public relations, working for small family-owned companies and international corporations, she has faced her share of life transitions. Juggling the responsibilities of her busy career while dealing with divorce, caring for her parents, relocating, changing careers, remarriage, a layoff and forced early retirement, she learned about resilience, compassion (especially for herself) and what powered her through. After retiring from IBM, María reinvented herself so that she can teach other professional women what she learned — when life happens to even the strongest among us, there is light at the end of the tunnel, and that light comes from within. And, when we find that light it leads us to a remarkable new beginning. She believes that it’s every woman’s birthright to follow her dreams, and when she does that successfully, she can create a world where everyone around her benefits. Each woman’s values, vision and passion are the foundation for that world. When women are empowered to design a strong foundation, everyone wins. And she can do anything she desires. As a Certified Life Transition Coach for Women, María created a program called 5 Petals of Power, which is the foundation for her online group workshops and private coaching sessions. 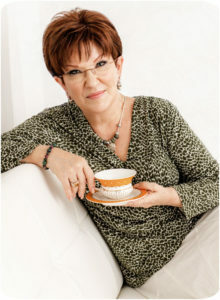 She is a transition expert, coach, speaker, workshop facilitator, trainer and best-selling author. When she’s not empowering professional women to be their best, you can find María in her sanctuary-home with HeartMate Jim, and her four fur-babies, where she’s likely to be cooking, crocheting, playing with her grand niece or designing floral arrangements. María believes collaboration and cooperation trump competition every day of the week, and she loves to collaborate and connect with like-minded women.